With m ore than one million Syrian refugees in Lebanon, the country has reached the highest rate of refugees to residents in the world today1. This reality presents, without a doubt, a very serious challenge to the security and stability of Lebanon in a region that is already in turmoil. The international community has unanimously and continuously extended gratitude and appreciation to the Lebanese government and people for their generosity and welcoming of the refugees, and has shown significant support to Lebanon’s efforts. However, the relative stability remains precarious and hardly sustainable. International aid has reached only a small percentage of the amount requested by the host countries, notably Lebanon, to cover the cost of hosting refugees and the crisis’ implications on the host society and economy. The international community has also failed to share the demographic burden by not resettling an ample number of refugees in third countries. Refugees from Turkey, Lebanon and Jordan have reached a level of desperation that has forced them to take their chances at sea in the hope of reaching a safer land where they can provide a better future for themselves and for their families. Thousands of men, women, and children have perished as a result. In Lebanon, further legal, political, economic and social complexities have added to the already harsh reality, making the situation extremely volatile and dangerous not only for refugees but for the Lebanese host communities and Lebanon in general as well. This has led the Lebanese Government to establish new regulations regarding the entry of Syrians into Lebanon in an effort to limit the economic, security, social, environmental, and demographic repercussions, after it had initially completely opened the borders and left the management of the crisis to international organizations, nongovernmental organizations, and municipalities. The new regulations only allow refugees entry under exceptional humanitarian cases, and revoke refugee status upon crossing back to Syria, which could lead to an increase in illegal entry, lack of of cial registration, and the loss of the ability to effectively guarantee refugee rights and monitor marriages and births. 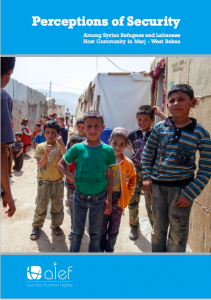 The case study at hand centers on the village of Marj in West Bekaa. Marj represents the archetypal host community as its majority population is Sunni Muslim, it is close to the Lebanese- Syrian border, is mostly agricultural land, and boasts a welcoming socio-cultural environment, all of which have made it a favorable destination for refugees, whose numbers have now exceeded the number of the villagers themselves. Five years into the Syrian conflict, and with no near end, the hope of refugees returning to their places of origin is fading, and the initial temporary arrangements are no longer adequate to sustain such protracted displacement. The lack of resources coupled with an increase in refugee needs have inevitably led to tension among the refugee population and with their host communities, a tension that has become associated with a serious security threat as well as discrimination and prejudice.